Install a modified bitumen roof if you want durability in your roofing choice. If you’re a business owner who wants to invest in a roof you can trust to be low-maintenance and durable, you should go for modified bitumen roofing in Dallas, TX. Legends Roofing contractors recommend this two-ply roofing method to commercial customers with flat roofs who need a quick roofing replacement but don’t want to worry about lengthy future repairs. Get in touch with us to find out how modified bitumen roofing allows business owners to save time and money. Call us anytime at 214-321-3293 for more information and to set up appointments. Modified Bitumen roofing is perfect for commercial enterprises. If you need a quick roofing solution, contact Legends Roofing today. Our contractors will safely work to expertly install this roofing material fast. Then you can get on with enjoying minimal repairs and low maintenance with modified bitumen roofing for 15-20 years. This two-ply roofing material is made of rubber and plastic. The rubber works to provide you with a perfect roofing solution that can expand and contract appropriately in the fluctuating temperatures of Texas. The plastic is a perfect, impervious membrane that provides protection against hail, rain, and snow. Because of incredible durability, you don’t have to expect many repairs throughout your time under modified bitumen roofing. Scheduling regular maintenance is always the best way to go with any roofing material but beyond a periodic maintenance call, you should expect minimal fixes with this roofing type. Staying in good contact with your Legends Roofing contractor will ensure you get the best out of your roof for years to come. Looking to take it even further? Talk to a Legends Roofing contractor about roof coatings. Modified bitumen roofing equipped with an energy saving roof coating ensures business owners decades under a strong, durable roof. Get twice the protection and peace of mind with Legend Roofing roof coatings for modified bitumen roofing. 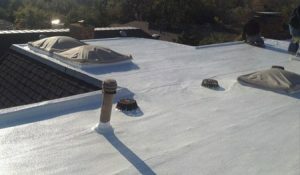 We exclusively install silicone and acrylic roof coatings for added waterproofing and energy efficiency. We recommend modified bitumen roofing to any commercial customer who wants to save money and time on their roofing investments. Hire Legends Roofing contractors to professionally install modified bitumen roofing for you in Dallas, TX. With minimal and quick repairs, you’ll save time and money for more than a decade. Call us at 214-321-3293 today to schedule a roof replacement or installation with Legends roofing.